Chris Urmson thinks that robots are better drivers than you. Who the heck is he and where does he get off dissing us humans and saying that robots are so great? Well, he is the guy who is in charge of Google’s self driving cars project involving Prius and Lexus vehicles. 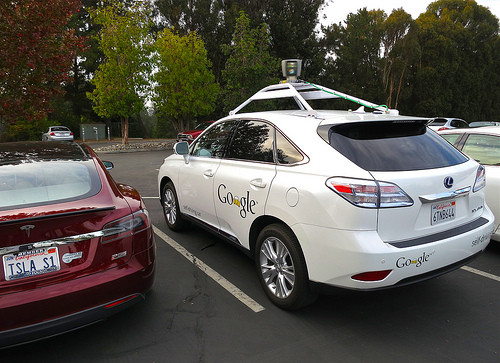 He was talking at a robotics conference in California recently and said that the Google car went more smoothly and were safer than vehicles being driven by professional drivers. These cars have been getting driven around since 2010, although there is always a human on board to take over if necessary. His opinion was based on a couple of factors. First of all, studies they have carried out show that robot driven cars brake and accelerate less sharply than those which are driven by those useless old homo sapien fools. The other point is that it has been shown that self driving cars are better than keeping a safe distance away from other cars. Well, in that case the idiot that almost ran into the back of me this morning was definitely made of flesh and bones. An interesting point he made was that one of the Google cars was hit by another car (driven by a stupid human, I guess). The data collected by the car was enough to work out exactly what had happened without relying on eye witnesses. One of the current ideas Google is working on is a brand new dashboard design which will allow motorists to see what the self driving car is up to and give them the chance to decide when they want to take over. What do you think; can you drive better than a robot or is it time to admit that we should hand over the controls of our vehicles to the cars themselves? If it is the latter, have you even seen the Matrix? This isn’t going to end well.